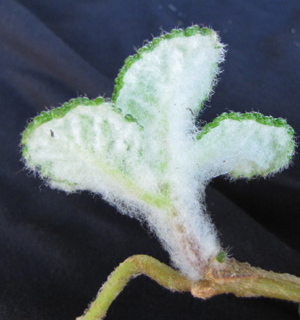 This species is remarkable for the thick white wool on the back of new leaves and on the tips of new shoots. Dr Alain Chautems is preparing the Gesneriaceae family of the "Illustrated Flora of Santa Catarina State" and had some doubts about a few [specimens of] dried material that he was analyzing... One of the doubts was a Sinningia that looked like a small leaved S. lineata that someone had collected years ago at a place called "Testa do Macaco" (Monkey's Forehead). So we went to Florianopolis, Santa Catarina. Dr. Ademir Reis from the UFSC (Federal University of Santa Catarina) hired a local guide to take us there. After half hiking and half climbing up a mountain for 2 hours we finally reached the plant! Florianopolis is an island off the coast of Santa Catarina state, in southern Brazil. 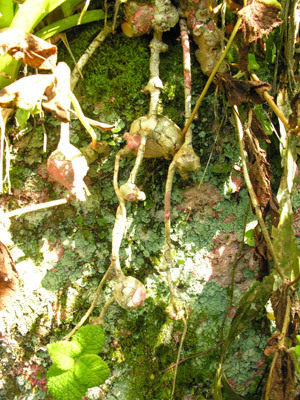 The plant was growing on vertical hillsides (one of the favorite sinningia growing places, it seems, since S. nivalis, S. hatschbachii, and S. calcaria grow in similar situations). This plant is notable for its hairy leaf undersides. Mauro said the plants he found did not have sticky leaves, but my plants sometimes do. 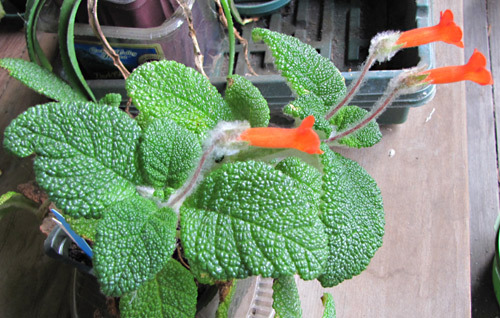 Another remarkable feature is the quilted (bullate) leaves, more like an episcia than a sinningia. The hairiness on my plants is on the stem of the top two internodes and the reverse of the top two pairs of leaves. It's not easy to tell whether the hairs on the stems and leaves lower down just drop off or somehow mat against the plant surface. I don't see any signs of fallen hairs, but neither do the lower stems have matted hairs. 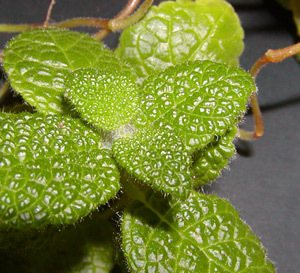 In S. leucotricha, the hairiness of leaves and stems is diluted by the expansion of the leaves and stems themselves. This does not appear to be the case here, since the upper internodes and leaves have a very hairy appearance even when they have reached full size. 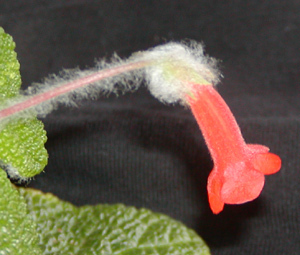 The flowers much like those of Sinningia lineata: orange-red tubes, flaring lobes, and some darker red markings in the throat. According to Mauro, the plant blooms year-round in his conditions. My plants were reluctant to bloom until I put them in locations where they got several hours of sunlight per day. Very bright light appears to stimulate blooming, and I have not yet seen any leaf burn due to too much sun. The next two pictures are courtesy of Alain Chautems. The picture below shows this species growing on an almost vertical slope. Other specimens were found near bromeliads. Some appear to have a chain of tubers connected by ropy stems. The first couple of years I had this plant, others complained they had not been able to propagate this species from cuttings, but noted that it bloomed almost constantly. My plant, on the other hand, did not bloom at all, but cuttings rooted quickly. However, once my plant got large or old enough to bloom, cuttings invariably failed to root. They would last for months, but form no roots and no tuber. Thus, this species appears to obey the general rule for sinningias: it is very difficult to root blooming stems. The moral: When your sinningia doesn't bloom, take cuttings. This might be your last chance! This picture shows the interesting fruit of this species. The calyx lobes are curled back from the pudgy reddish capsule. 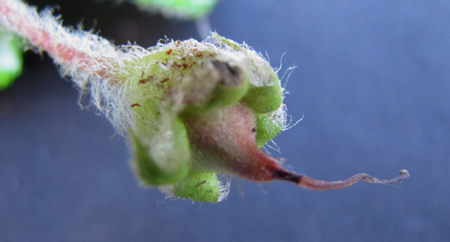 What look like seeds from an older fruit are caught in the white wool on the backs of the calyx lobes. The only thing worth noting is that the picture was taken on 1 December 2010. Within the preceding two weeks, there had been about four nights of frost. My outdoor sinningias all survived that, but some had damaged leaves. This one, and a few others, not only didn't suffer any visible harm, they didn't even stop blooming. This suggests to me that on its native island, Sinningia bullata is exposed to a chill on occasion and has learned to cope. Since it does not appear to be a seasonal bloomer, it has acquired the ability to deal with a range of temperatures. Jim Steuerlein of Florida has done a number of crosses with this species (which he calls "Flo" in reference to its home island). He has crossed it with Sinningia macrostachya, S. eumorpha x piresiana, and S. muscicola ("Rio das Pedras"). Jim also crossed Sinningia bullata with Sinningia conspicua. The next two pictures show the resulting hybrid. This is a very nice combination of the two parents, with leaf texture from Sinningia bullata and flower size and some of the shape from Sinningia conspicua. It does not, however, have any of bullata's white wool under the leaves. This wool does not appear in any F1 hybrids that I have seen. 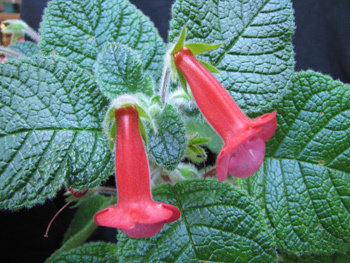 Like many hybrids of Sinningia conspicua, it has a noticeable fragrance at certain times of day and to certain noses. Wallace Wells has crossed this species with S. insularis. As of February 2010, it had not yet bloomed. Mike Kartuz has crossed this species with S. eumorpha, and named it 'Romanza'. Dave Zaitlin crossed this species with S. tubiflora in 2011. In 2018, Dee Stewart posted on Gesneriphiles a picture of the cross in full bloom. 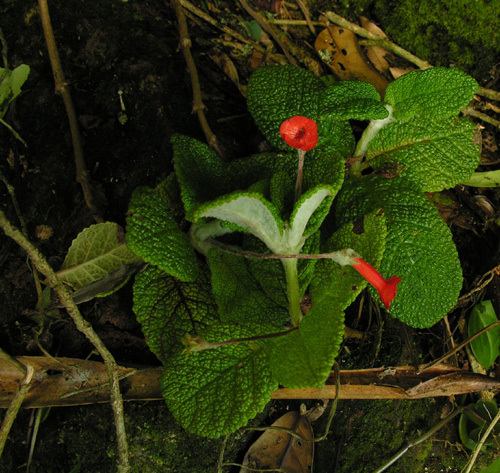 The plant showed typical bullata foliage with red stems and pinkish flowers with bullata-shaped corollas. The plant appears to have multiple flowers per axil. Mauro Peixoto found a plant he believes to be a natural hybrid between this species and S. leopoldii. 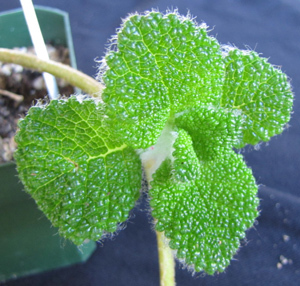 It has the quilted foliage of the bullata parent, but not the hairiness on the leaf reverse and on the stem. Iain James of British Columbia has done a number of crosses with this species, to get very interesting leaf textures. One example can be seen here. This is Sinningia pusilla x bullata. Mr. Wu Jui-Jung in Taiwan created this interesting hybrid. Dale Martens took this picture of her own plant. 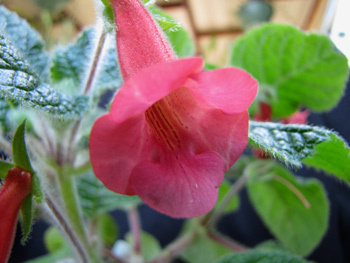 The red flower color is noteworthy, since almost all pusilla hybrids have flowers which are lavender or some similar purple-derived color. Dale crossed Mr. Wu's S. pusilla x aghensis with S. bullata, and we have a picture. Dormancy No dormancy observed on young plant indoors. The plant does have a tuber, and cuttings form a new tuber after just 3-4 months. 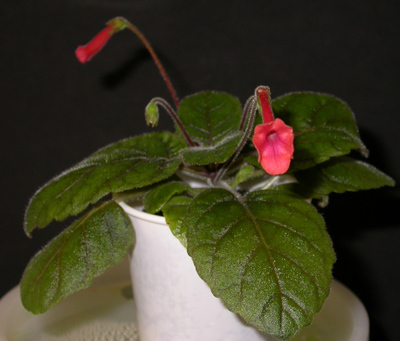 The first publication of this species in 2010 notes "apparently lacking dormancy period", and that is consistent with my experience, which includes a plant blooming in mid-winter. Season Bloom appears to depend on shoot maturity rather than time of year. Very bright light (including some full sun) encourages bloom. From seed No data yet. Hardiness Has survived 30 F (-1 C) without damage (January 2009) in my yard, and 20 F (-7 C) in Jim Steuerlein's (the tubers, that is, not the leaves). Propagation Stem cuttings rooted easily for me until the plant reached blooming size. Thereafter cuttings generally failed to root. However, the plant then readily set seed. Recommended? Yes, just the woolly stems are reward enough. Taxonomic group In the douglasii group (but just barely) of the Dircaea clade. Location Florianopolis, Santa Catarina state, Brazil. Mauro Peixoto's Brazilian Plants site has a page about S. bullata, with a picture showing the striking flowers. Chautems and Peixoto in Candollea, 2010.